Brannon's Pub & Brewery opened in Beaverton last week and I accepted an invitation to check them out last night. Living in SE Portland I don't get to that part of the metro often and I don't have a problem admitting that if I hadn't been invited, there's a good chance it might have been quite a while before I visited. Thankfully wading through rush hour traffic to get there turned out to be worth it, revealing a couple of beers and food that hit high notes for me. Before we get to my favorites from the brewery and kitchen, a little background for you. Kevin Brannon, and his business partner, Chris Evans, began working on the concept for the brewpub a little over a year ago and quickly assembled a team with Devin Benware heading up the brewing operations and Sean Beanblossom running the kitchen. Devin, although only in his 20's, has been honing his brewing skills for years, embarking on home brewing while still in high school in Vermont. After relocating to Portland he took a kitchen position at Old Market Pub & Brewery and made his way into the brewery the same way many do - cleaning kegs. I tried six of Devin's beers and it was Thunderbuss, an oatmeal stout of the dry, roasty variety, and Vernepator, an Americal Pale Ale with substantial hop character, that made my taste buds light up. If you know much about my taste buds this will come as a bit of a surprise to you; it did to me. Vernepator was actually the first beer of the evening and I wasn't sure about it at first but as I continued to sip it, the citrus and pine notes of the hops built and I realized I was quite enjoying it. Thunderbuss was more of a hit with me right from the get go, hitting my stout sweet spot, one that is restrained in sweetness with a roasty body. I had expected the IPA and black IPA to be my favorites but both were maltier than I prefer. Devin, less than since making his first batch in the 10 barrel system, made a couple of comments that belies his youth and I hope speaks to a bright brewing future for him and Brannon's. The first was in response to a question regarding plans for other beers than the current lineup, to which he replied, "The basic beers need to be perfect before we go in another direction." As a follow up to that he also commented that he wants to improve on the current recipes but he, "wants to know what Beaverton wants to drink," and work in that direction. Now a bit of background on the food side of the operation. Sean, another young 'en, spent most of his life in Washington, just a few miles from the Canadian border. During his trek south to Portland, via Seattle and Bellingham, he obtained a degree in culinary arts and gained experience at a variety of restaurants. Kevin joked that Sean "came in the box" with the Woodstone Corp. hearth oven that was carefully selected to turn out pizzas like the Neapolitan ones he'd fallen in love with during a trip to Rome. 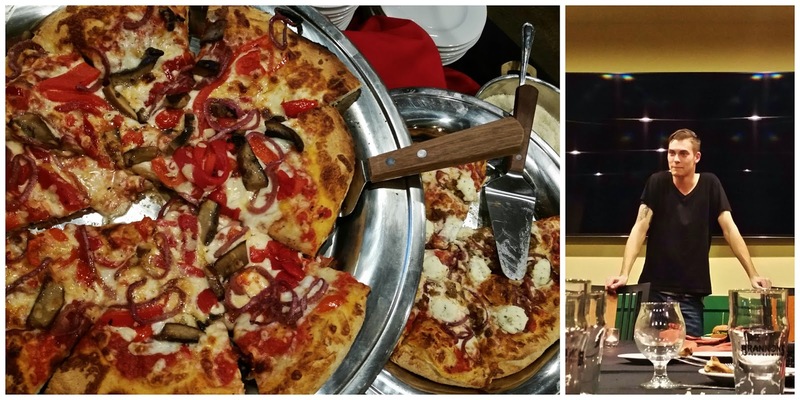 The pizza was the highlight of the food part of the evening for me and although I'm not stuck on a certain style I know what I like, I know they're hard to find and I know the ones Sean is making go on my short list. I'm not sure when I'll make it back to Brannon's but you can be sure that I'll be keeping my eye out for the monthly beer and food pairings that are coming down the pike in the new year. Perhaps I'll see you there. I may have chosen the coldest, wettest, most miserable day of the five day run to attend this year's Holiday Ale Festival but there were some outstanding beers that made it worth it. With that said I encourage you to keep in mind that I only sampled about a quarter of the 50+ beers at the festival (one can only drink so many big beers in one sitting no matter how strong one's resolve is) so I may well have missed trying some great ones on my first day. For the most part I did a good job of sticking to the pre-set order on my hit list, only skipping over the ones that were two or more tickets. Now, just in case you think I was being cheap by doing that, let me set you straight. I had you, my dear readers in mind, and I wanted to make the most of my time and tickets so I could more thoroughly report back to you. That meant I skipped over Nectar Creek Triple Brett, Feckin Top O' The Feckin' Mornin', Cascade Gingersnaps and Portland Brewing BBA Imperial Stout, beers which if I can make it back for a second visit will be high on my list. Of the beers that I did try the two that hit the most high notes for me were Oakshire Prestidigitation and Stone New Desecrator. As I was putting my list together part of the draw for Oakshire's offering was that the description reminded me a lot of Cascade Brewing's Oblique Black & White Coffee Stout. It was the first the blonde stout I tried and it made a huge, happy impression on me. Oakshire's version, a white chocolate milk stout, had the aroma of white chocolate and the flavor was reminiscent of Oblique, but with a stronger coffee punch. It's an amazing beer and at only 7% ABV, one of the lighter beers you'll find at #HAF19. I have my fingers crossed that they made more than just what was sent to the festival and that over the next few months I'll be able to have more. If nothing else, I hope it will reappear next winter. The other beer, Stone New Desecrator, was one that as I put it on my list I was actually a little hesitant about. Don't get me wrong, I'm a big fan of Stone's beers and hoppy beers in general, but a black barley wine, we'll, I wasn't sure how well that would work. Silly me. Not only was it visually appealing, with a huge, creamy head, but it was perfectly balanced between providing the hop character of a black IPA and the warming booziness of a barley wine. The rest of the beers I tried ran from ones that weren't my favorite stylistically but I could appreciate them for what they were to ones nearly as good as my two favorites. Thankfully, and due in part to heeding the warnings from my beer friends, I didn't get any "drain pour" beers. If you've been, or once you go, I'd love to hear your favorites. 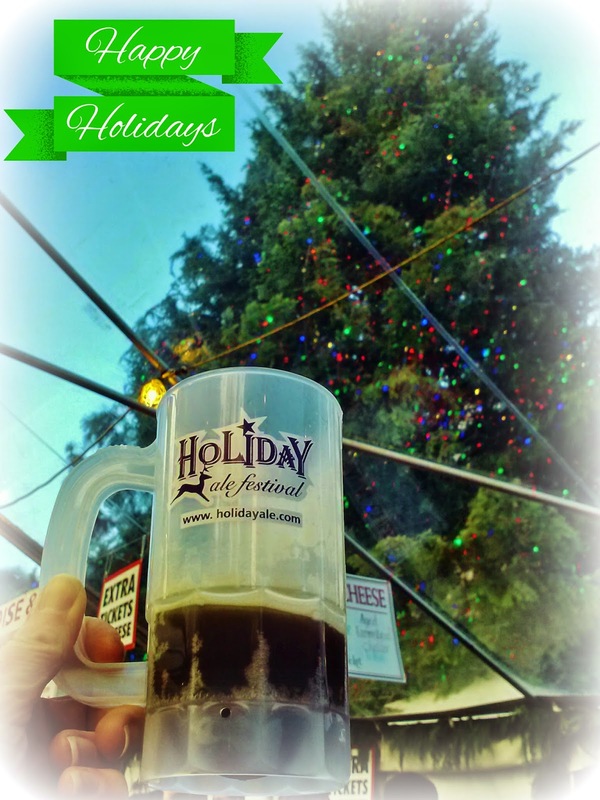 Today is the first day of the 19th Annual Holiday Ale Festival although how we got so late into the year is beyond me. Perhaps it's due to how late Thanksgiving fell. Nonetheless, I'm staying true to my standard beer festival preparations with a perusal of the Standard Release Beers list and creation of my hit list. Knowing I'd have to ax a fair number of them beers I ruled out ones I've had (like Kell's Boom Roaster, which is phenomenal! ), beers I suspect I may be able to get elsewhere (like Lagunitas Scare City 2) or beers that are just not stylistically preferable to my palate (Belgian/Belgian Strong Ales). 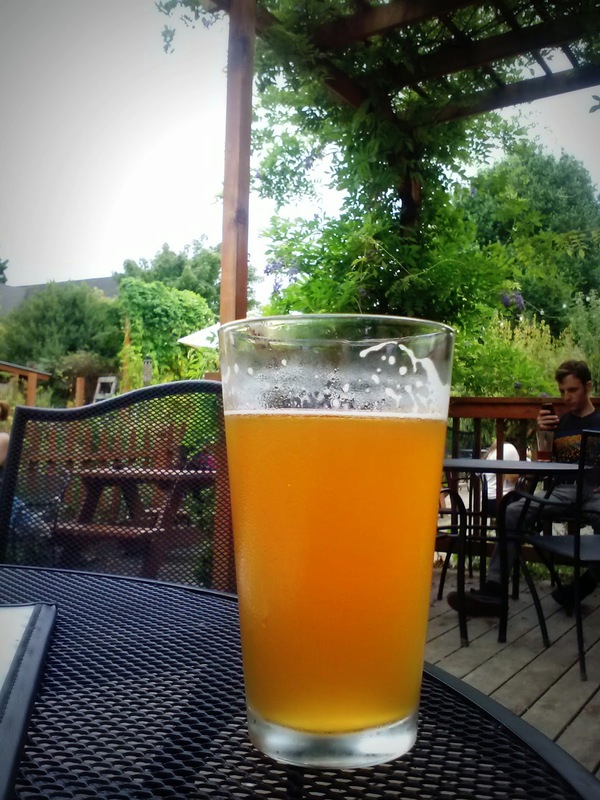 As I made and reviewed my list I was surprised to find that I included some breweries I tend to pass by, but have been coming around to more lately, (like McMenamins and Portland Brewing). My initial cut yielded a mere 15 beers I definitely want to try and an additional 13 maybes for the B Side of my list. That boils down to a pretty doable amount, especially if I make it multiple days. Invariably I'll be disappointed by some I was most excited to try and conversely wowed by some I had dismissed (but was tipped off about from some of the beer friends I'll surely run into). But that's part of the fun, just like as a kid shaking the packages under the tree trying to guess what's inside. May your #HAF19 mug run over with goodness! 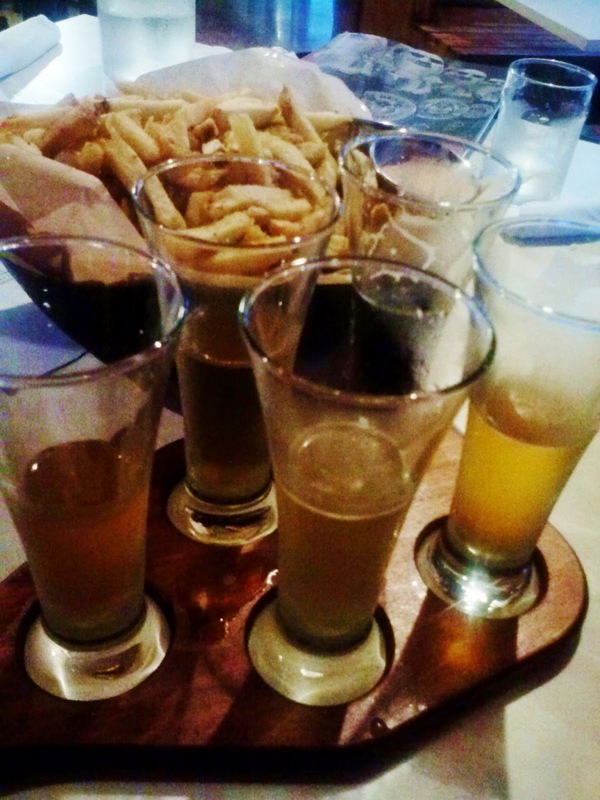 Raise your hand if you'd like to eat an insane amount of delicious food paired with an equally amazing beer flight. 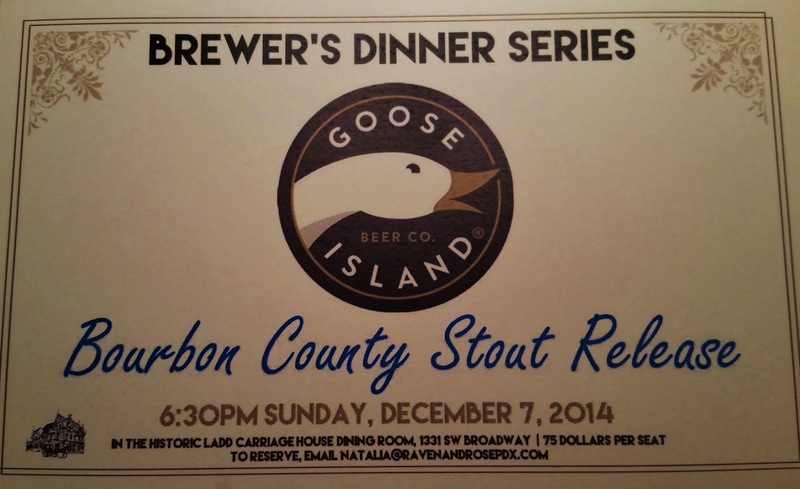 That's what Raven & Rose is serving up this Sunday at their Brewer's Dinner Series Goose Island Bourbon County Stout Release. I was invited to preview the dinner over the weekend and if you're not into hearing me gushing about food and beer you should stop reading right now. The meal started off with a full pour of Goose Island IPA and a basket of what appeared to be fairly standard bread, butter and crackers. "Crackers" really doesn't do these delicious buttery, salty, house made squares of goodness justice but I can tell you that I could have eaten my weight in them. The dinner then got rolling with a bitter greens salad, because one should balance all that butter with some greens, right? After a great intro, things kicked into high gear as a four beer flight was brought out consisting of Class of '88 Belgian Style, Matilda, Madame Rose and Bourbon County Stout. 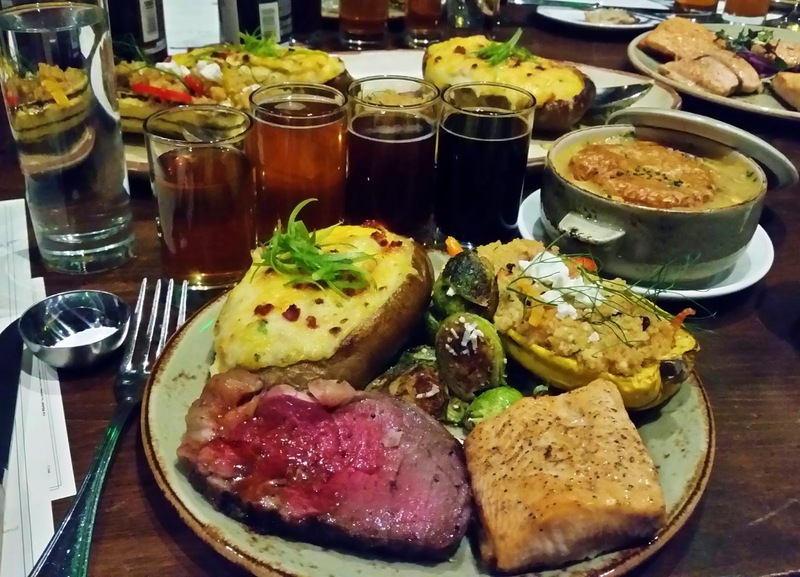 Then the table proceeded to be laden with platters of Painted Hills grass fed prime rib, Columbia River King Salmon, twice-baked potatoes, roasted Brussels sprouts, stuffed delicata squash and pot pie. While the sides may be slightly different this Sunday the prime rib and salmon will remain. Raven & Rose sources as much of their food locally as possible meaning what looked the best last weekend went my sides but something else may look even better to create yours this weekend. The meal was and will be served family style, a deliberate move to encourage interaction at the table. Bar Director David Shenaut explained that they want to encourage diners to mix and match, to explore pairing the beers with each dish as they see fit. For those looking for more direction, they'll have that covered, too, as Goose Island representative will be present at Sunday's dinner. Taking the recommendation I tried each beer with each dish, finding one of my favorites to be Class of '88 with the prime rib. My least favorite beer on its own was Matilda yet it was the one I felt worked the best with the greatest number of dishes. Keep in mind that when I say "least favorite" it's only because I hold the other three in such high regard that being served just them, without any food, would be a delightful [liquid] meal. As the main portion of the meal came to a close I finished off the last of my Class of '88 and Madame Rose, restraining the urge to do the same with the Bourbon County yet also wanting to try some with dessert. Dessert, while the most modest portion of the night, seemed as large as the rest of the meal in flavor. 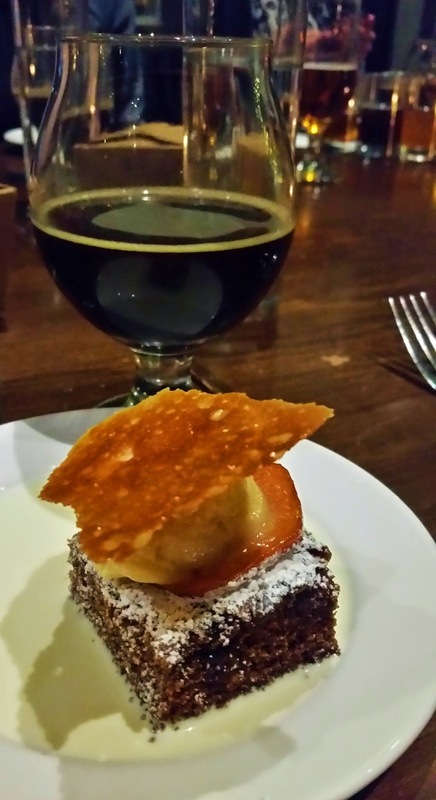 Black sticky gingerbread, quince sorbet, ginger tuile, poached quince and warm sweet cream was served with a pour of Bourbon County Barley Wine. 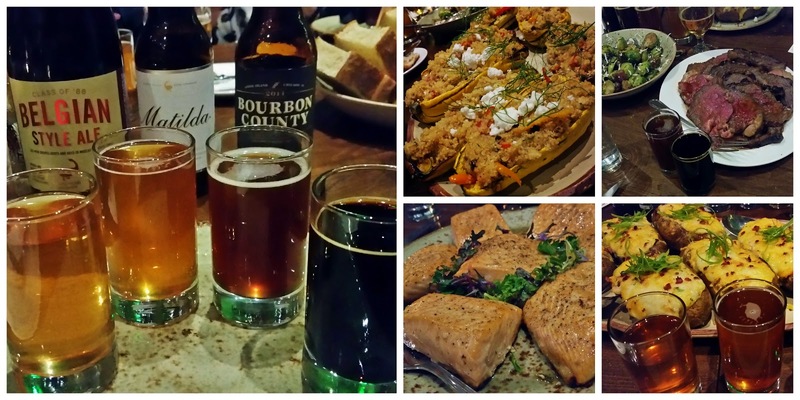 The beer was outstanding alone and with the dish, which was just as good with my remaining Bourbon County Stout. The trifecta was completely decadent and more than my happily full belly needed but I was unable to stop until I'd scooped up every last crumb and downed every last drop. If you're now drooling, pick up the phone and give Raven & Rose a call to reserve your spot for dinner taking place at 6:30 pm this Sunday, December 7. Perhaps it was my recent (and very successful) foray making brownies with and subsequently eating alongside Portland Brewing BlackWatch Porter but when I received beer mail containing McMenamin's Kris Kringle I was immediately preoccupied with what I would like to make and then drink it with. For whatever reason gingerbread sprang to the forefront of my mind and upon locating my go-to recipe for it I forged ahead. Before embarking on the baking however I wanted to sample Kris Kringle on its own. Poured into a glass the dark amber color again made me think of gingerbread. Inhaling the aroma, I found it to be sweeter than expected. That sweetness didn't carry through to the flavor however; it seemed more that of an amber or a nut brown with a more assertive hop presence. Setting the beer aside I began making the gingerbread, opting to bake up mini-muffin bites instead of using a standard baking pan. Partway through I returned to the beer and found as the beer warmed the hops became more prevalent from start to finish and ultimately overtaking the sweetness. Mixing up the batter and baking the mini-muffins went by quickly and soon I ready to see if my experiment would pay off. As it turned out not only did the bites turn out delicious on their own, their mild sweetness meshed well with the hoppiness of the beer. In turn the beer served to help make the ginger and cinnamon pop. 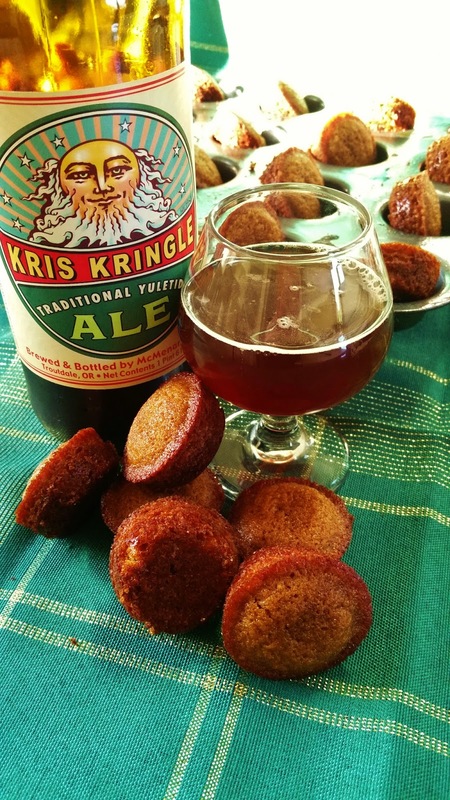 If you're looking for something new to leave out for St. Nick I'd highly recommend a plate of these gingerbread bites and a bottle of Kris Kringle. No matter how bad you've been all year he's likely to overlook those lapses as he enjoys this pairing, finding someone else's stocking to leave your lumps of coal in. Ever since expanding to Milwaukie Breakside Brewery has been putting more effort into their sour program, much to my delight. Last night I had the opportunity to get a first taste of a couple of I'm sure my fellow sour fans will want to get their hands on. 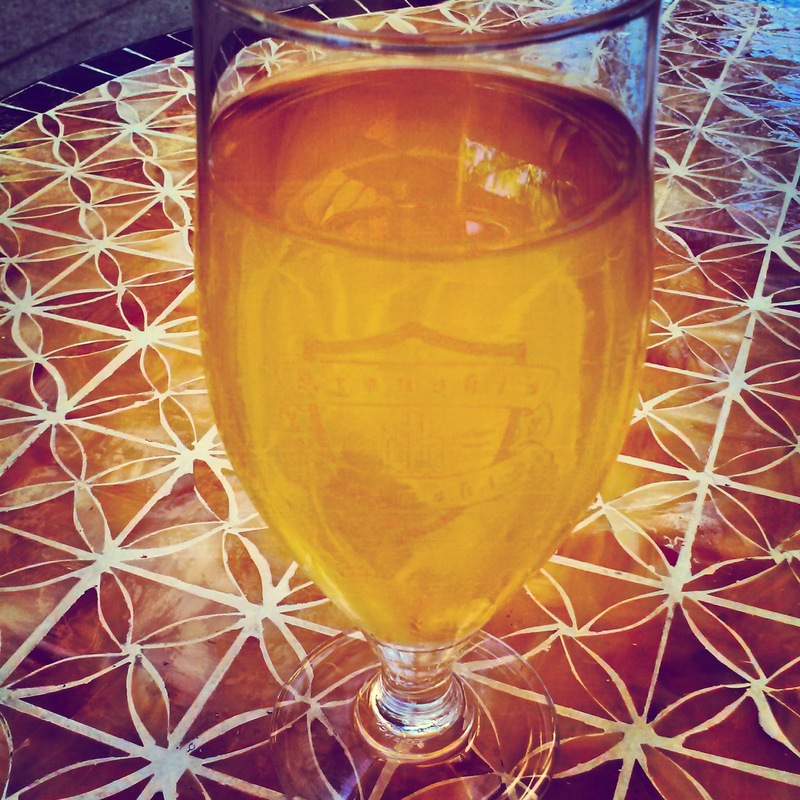 The first was Country Blonde, a Belgian Blonde that sat on grapes and utilizes Brett. It is a very drinkable beer, one that I see appealing to both sour beer lovers and those just coming to appreciate it. Be careful though, at 7.8% plowing through a couple of bottles could knock you back on your heels before you know it. Only a small batch of this bottle conditioned beer was made with 30 cases being available for sale on Friday, December 5th exclusively at their Dekum pub and Milwaukie production facility. The second was La Torenta, a dry hopped sour ale, which is Breakside's final bottled beer release for 2014. The beer was brewed as a tribute to their senior brewer, Sam, who will be leaving this month to explore lobbyist work. The beer was brewed in 100% stainless, using lacto and Equinox hops, the latter giving it a resinous/tangerine character. 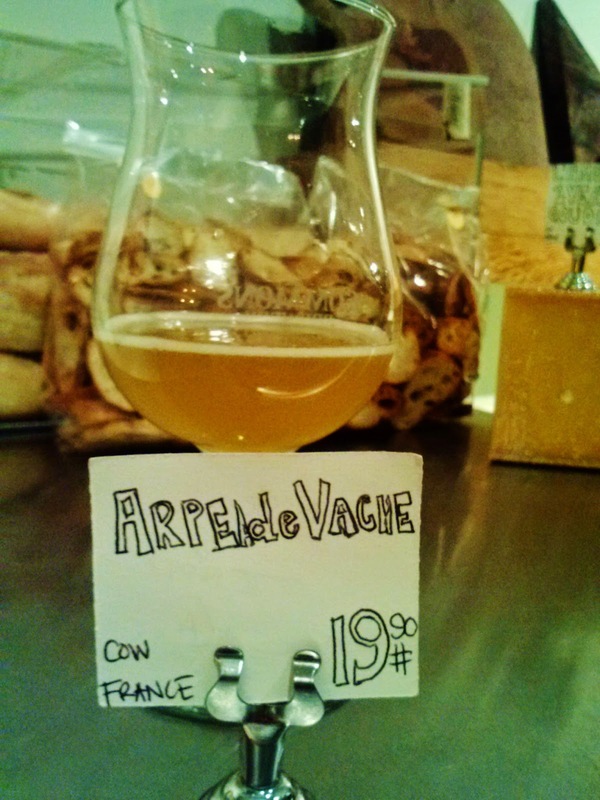 It has a little bit of that funk I so enjoy and played nicely with the Arpeada Vache cow cheese from France that Steve selected. The third beer of the tasting broke stride being both non-sour and one that is a draft-only offering. Simply called Imperial Red, this is a one-off, hop-forward beer has enough body to be balanced and deceptively drinkable at 8%. It was paired with L'Amuse Gouda, a cow's milk cheese from Holland, that had a dry sharpness similar to a parmesan and the combination was great. 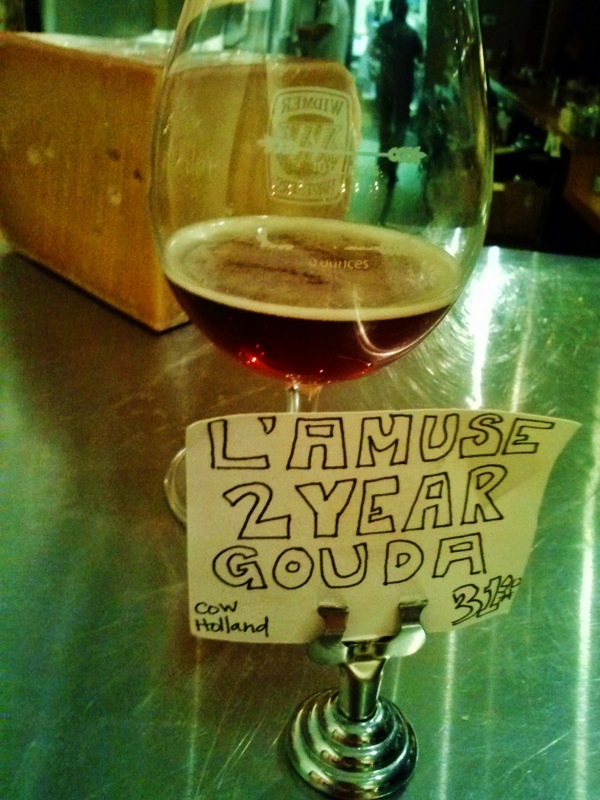 Keep your ears open for locations that put this on tap and then swing by Cheese Bar to get some of this gouda to enjoy with it. 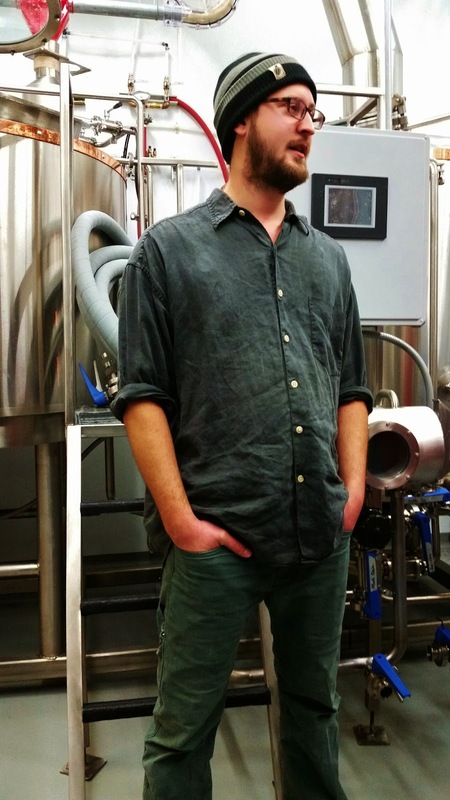 In addition to tasting these three new beers, brewmaster Ben Edmunds shared other tasty news. 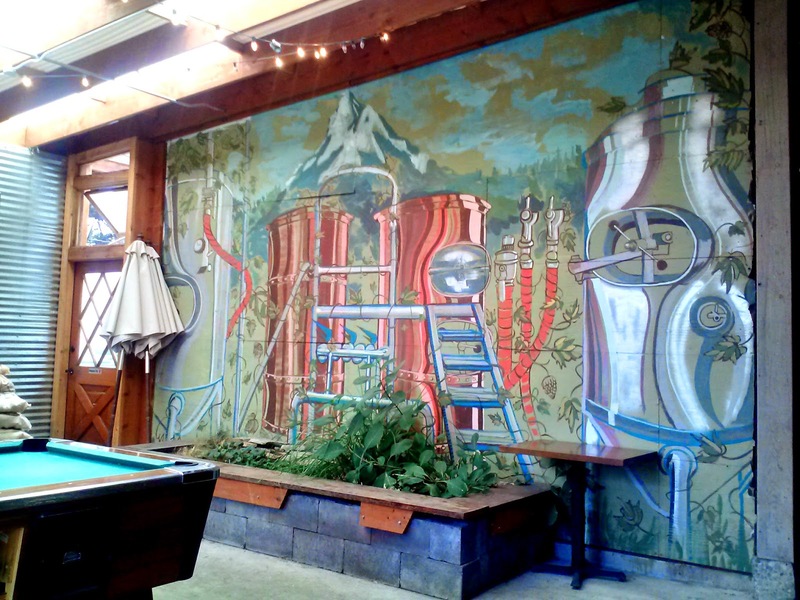 - The Milwaukie tasting room will now have four dedicated sour taps. - Also at Milwaukie, they're starting "library" or "vintage" flights, in which they'll be cracking open bottles on the weekend, pouring them until they're gone. Then you'll have to sit tight until next weekend to see what they've rounded up. - They are bringing a new R&D brewer on, Michael Brady from Boneyard. - They have five collaboration beers for CBC 2015, which will be held in Portland, the first of which is being brewed today with brewmaster Mitch Steele from Stone. Tonight, November 19th, is the first of two La Tormenta release parties and will take place 5:00 - 7:00 pm at ABV Public House in Hillsboro. If you can't make that one, or you're an eastsider like me, make plans to visit The BeerMongers for the second release party on Thursday, November 20th starting at 5:00 pm. And if you happen to be reading this from the Seattle area, rejoice in the fact that Breakside will be doing a third release party at Bottleworks on Friday, December 5th. When a recent box of beer mail arrived on my doorstep containing Portland Brewing BlackWatch Cream Porter I enjoyed one bottle as soon as I could get it chilled. Porters are a style I tend to pass over in favor of stouts, which are typically more robust and more to my liking; BlackWatch however has the perfect amount of body and roast to make it a solid choice for a chilly night. A few days later I decided it was time to restock the freezer with some cookies or brownies, for those times when my sweet tooth screams too loud to be ignored. In the process of figuring out which to make I realized there was still more porter in my fridge and I set out to find a brownie recipe that would utilize it. 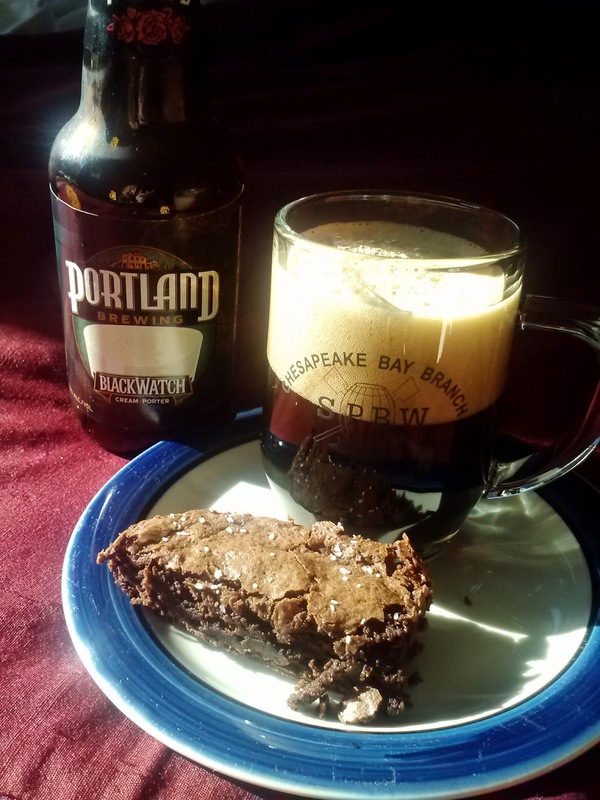 As it turned out all I could find were ones that called for a stout so I moved on to some tried and true brownie recipes. The closest one called for Bailey's Irish Cream but I was game. Turns out, with that substitution and a couple of others, I made a pretty tasty pan of brownies that went exceptionally well with BlackWatch. So next time you have a hankering for brownies, I'd encourage you to give this (super easy) recipe a try. The hardest part will be waiting long enough for them to cool, or perhaps not eating the entire pan as you alternate bites of the moist, chocolately goodness with sips of the slightly dry BlackWatch. Lightly spoon flour into a dry measuring cup; level with a knife. Combine flour, cocoa, baking soda and salt in a small bowl. Stir to combine. Place chocolate chips and butter in a sauce pan. Heat over low, stirring occasionally, until melted and combined. Stir in sugar and remove from heat. Add egg, porter and vanilla. Whisk to combine. Fold in the flour mixture, stirring until just moist. Spread batter into a 9-inch square or 11 x 7-inch baking pan coated with cooking spray. Bake at 350 degrees for 20 minutes or until toothpick inserted in center comes out almost clean. Sprinkle with coarse salt and cool completely on a wire rack. 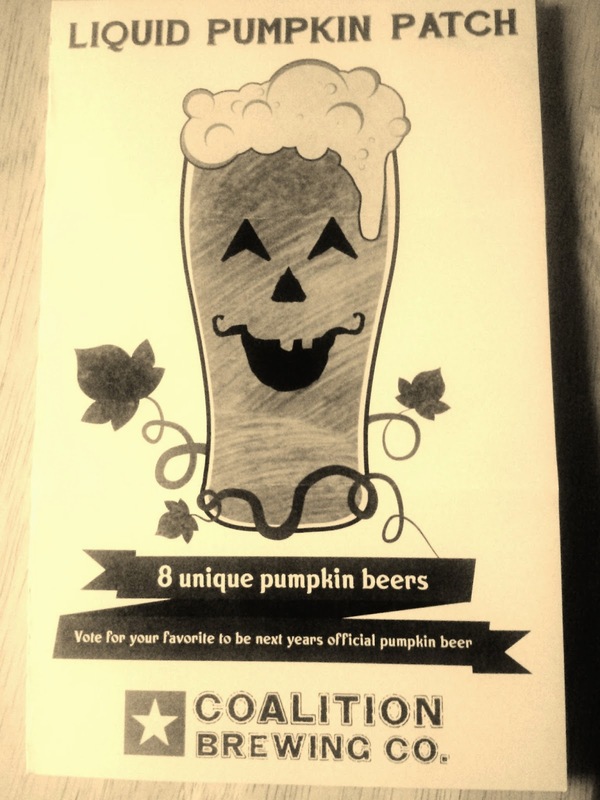 Bucking the trend of releasing "seasonal" beers far earlier than the season they're actually to coincide with, this past Saturday Coalition Brewing held Liquid Pumpkin Patch. 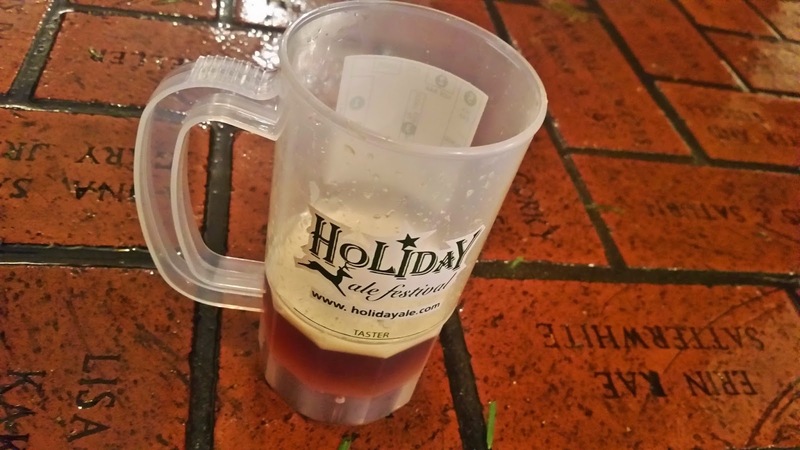 The just-the-right-size festival featured eight house-brewed pumpkin beers that ranged from variations on their Loving Cup Maple Porter to beers using smoked pumpkin to a first ever gluten free offering. I arrived not long after the festival began and was pleased to see the place already hopping. It certainly didn't hurt that it was an absolutely gorgeous day and Coalition had done a great job of promotion, encouraging people to arrive early as there was only a limited amount of each of the beers available. I made my way into the tasting room and selected Smokin' Gourd as my first sample, then headed back out into the November sunshine, along the way running into a friend. He had been there right when they opened and shared his impressions of what he'd already tried, helping me make my decision about what would be next. Throughout the next couple of hours, adding another friend to our small group, I tasted my way through all eight. I'll go through my impressions and provide the brewery descriptions of each beer below but I know some of you just want me to cut to the chase. You want to know what my favorite was and I'll indulge you; it was Stingy Jack, a pumpkin barley wine. Congrats to Elan and Mike on making eight very distinctive, imaginative beers. I hope this is a trend that will continue, one in which the energies they once had to devote to the pub are allowed to be put into fun one-offs like this. A beer that has over 10 pounds of smoked pumpkins that were smoked by our neighbors at The Blue Goose. A very smoky and spicy balanced beer that brings smoke and spice in one sip. I definitely got the smoke but it wasn't overpowering and was well complimented by the spices used. A pumpkin ale with some New Mexican roots...pumpkin spices, cumin, chipotle chili and roasted hatch chilies that were smoked by our neighbor The Blue Goose, give this beer its unique kick. I got the spice from the chilies but it wasn't of the heartburn-inducing variety. Rather it provided a pleasant heat that meshed well with the other components of this balanced beer. Our "Loving Cup" Maple Porter just packed on 12 pounds of roasted pumpkin and additional spices to really "pimp" this porter out. Drinking this, I really wanted a slice of pumpkin pie. 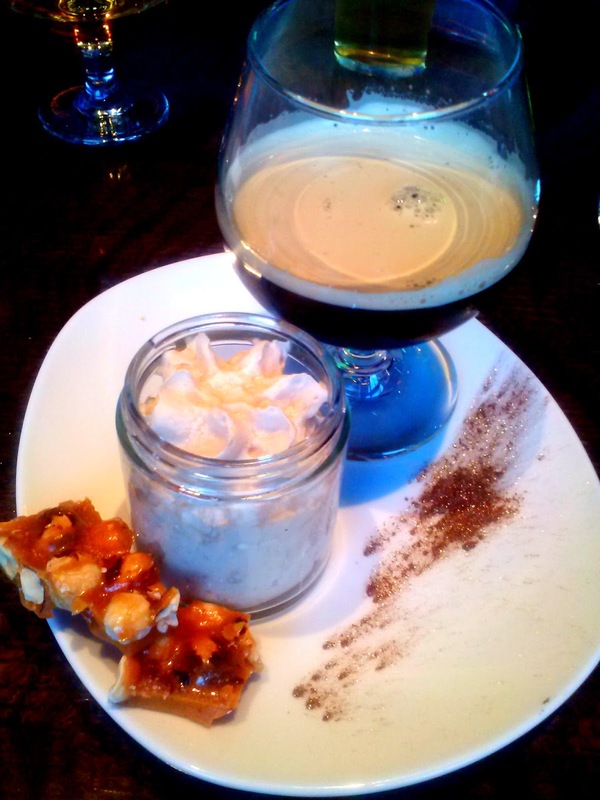 Restrained on sweetness, this would pair well with the traditional Thanksgiving dessert. What's a P.I.M.P. without some bourbon and oak to really enjoy an outing at the pumpkin patch? Buffalo Trace and American oak teamed up in this beer to take it to the next level and even get your tail wagging. The aroma was out of this world and the spices really popped in this version. It was my favorite of the first four. UPDATE: Coalition announced Monday evening that this was the crowd favorite and will be their production pumpkin beer in 2015. A sorghum-based pumpkin ale with pumpkin, spices and a lot of pop. Can you tell that it is gluten free? The aroma, no doubt from the sorghum, was almost sour, with the flavor changing as it warmed from more heavily sorghum-forward with that fading back as it warmed further. This beer was made in collaboration with PaaDee and Langbaan as a take on a traditional Thai curry dish. Made with lemongrass, Thai green chili, kaffir lime leaf, Thai ginger, holy basil and fresh gourds! My friend had built this one up as a favorite in the bunch and I was not disappointed. There was a lot going on, with the lemongrass, lime leaf and basil popping out for me, in the best way possible. A very refreshing beer, I'd love to see this make a reappearance in the summer. This sour ale was a minute late coming home after midnight and ended up turning into a pumpkin. It was kettle soured for 40 hours with Lactobacillus which delivers acidity to intermingle pumpkin sweetness. Although I enjoyed this beer, I'm a huge sour fan and would have liked the sour notes to be even more pronounced. That being said, it was my second favorite with only one beer left to try. A heavy barley wine balanced with the sweetness of pumpkin and spice, this beer pays homage to the Irish tale of Stingy Jack himself. Wow! One sip in and this was my favorite by far. The aroma was that of pumpkin pie just pulled out of the oven and somehow Coalition managed to get the entire flavor of pumpkin pie, the filling and the crust, into this beer. If you can find any, you'd better order it. I predict this will be the people's choice winner (to be announced this week). 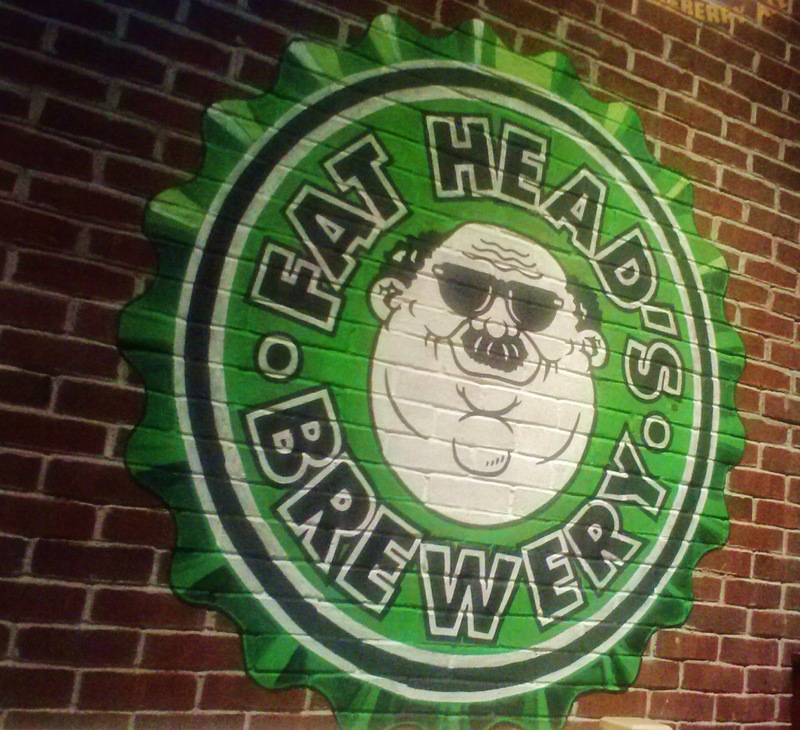 Earlier this week we gave into the buzz going around and checked out Fat Head's Brewery in the Pearl District. I had been "warned" that the place was big but I don't think I was properly prepared for the cavernousness of it, loosely portioned off into bar, bar seating and restaurant sections. We grabbed a high top in the bar seating area and dove into the beer menu. At the time they had six of their own beers on tap as well as a fairly extensive, and well-curated, guest tap list composed primarily of Portland craft beers. Knowing we would have to try them all we ordered a five-beer sampler, waiting to taste our way through those before ordering the pale ale. Bumbleberry Honey Blueberry Ale - With a slight blueberry aroma and flavor, it reminded me of Sea Dog's blueberry beer, and was much tastier than many establishments' "I don't drink craft beer" offering. Boogaloo Belgian Blonde - It smelled and tasted exactly like it should, just not a favorite style of mine. Zoobomb Dortmunder - Nicely mild German beer that Mag described as "a bit rank," leading me to wonder what hops were used. Ultra Pils - While true pilsner lovers might be underwhelmed, it was mild enough for me to enjoy it. Oompa Loompa Chocolate Cream Stout - A roasty, slightly sweet stout, this was a favorite for both of us. The food menu is as extensive, if not more so, than the beer menu. If you can't find something on it that doesn't sound good then you just aren't trying. We started off with an order of fries with our beer and were shocked by the nearly Easter sized basket of fries that came along with your choice of sauce. Giant in size and good enough in flavor, this is an easy pick to share with a group. One friend ordered the perogies, which he raved about, and after trying one, I have to agree. The pulled pork chili I ordered and the burger with chips (again huge) Mag got were fine but nothing special. So, would I recommend trying them out? Sure. Go for the beer (a little high priced for PDX but not outrageous) and if you happen to need some food you'll find the portions generous even if the quality isn't on par with that of the beer. And you probably should go sooner rather than later because even though they were busy enough for a Tuesday evening, the space is huge and I'm sure the rent is, too. I wish them well, and look forward to trying more of their beers, but I suspect they face much fiercer competition here than most of their other locations. Wednesday beer geeks (especially those in Oregon) received what I don't feel shy in claiming was a stunning announcement by 10 Barrel Brewery. The Bend, Ore.-based brewery, with a production facility in Boise, Idaho and soon-to-be-open Portland pub and brewery, announced that they had been bought by AB. My first thought was, "Dang, no more German Sparkle Party for me." My second thought was, "I wonder if Whitney Burnside (who was just named the brewer that will be heading up the aforementioned Portland location) was told about that before she accepted?" My third thought was, "I wonder how long will 10 Barrel's award winning Tonya Cornett will stay on?" While I wish 10 Barrel the best and understand some people will continue to enjoy their products, which as the owners say in the video announcement, will not change, they won't get any more of my money. It's the principle of the matter and one my better half summed up best by saying that it's not about the beer. It's about the simple fact that AB is only interested in craft beer and breweries in two regards. #1 - They will do everything they can to crush it. #2 - They will take every opportunity to benefit from craft beer, including absorbing breweries (like Goose Island) that they can purchase. I'm not disputing that the breweries they acquire will continue to make good beer (at least in the short term); in fact I hope they do and it would benefit AB most if they retain the consumer base they have worked so hard to build. I'm merely saying that I'll be voting in another direction with my beer drinking dollars. That covers my first thought. My second thought is somewhat more concerning to me. I would be quite surprised to learn that either Whitney Burnside or Tonya Cornett was informed about the purchase much more in advance than the rest of us. I'd wager that meetings were called this morning in which everyone outside of the founding triumvirate was notified; AB would have likely required the hush-hush until the ink was dry. And finally, my question about Tonya, is another wager I'd make. She is an incredibly talented brewer who I suspect will soon depart (in less than three months says my money) to either take a position with an incredibly lucky existing brewery or, as one of my Twitter beer friends suggested, start her own brewery. On the heels of this announcement I also heard a rumor that Oskar Blues may be acquired. Maybe the rumor mill is wrong. Maybe this is going to be one hell of a week for beer news. Either way, it's time for a beer, don't you think? Sorry for the all text, no pictures post...just really too stunned by the news. 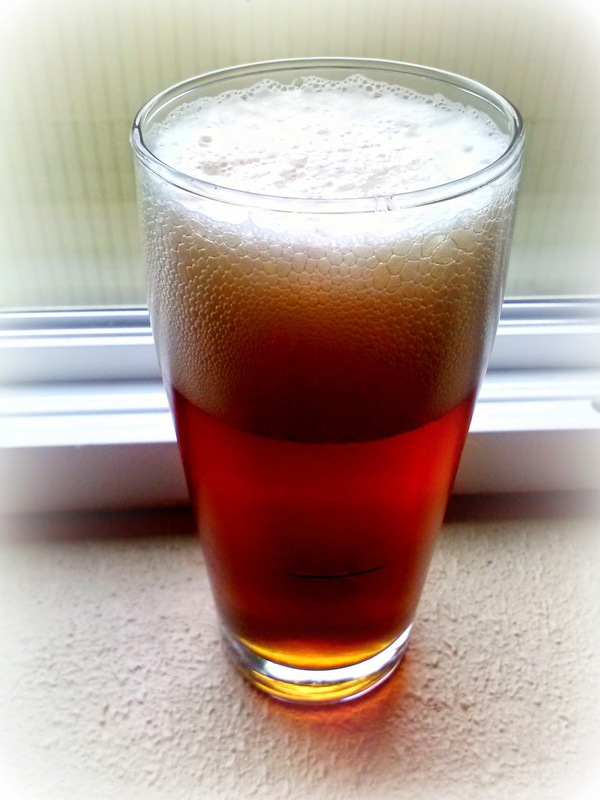 Beer & Coffee Preferences: Are There Any Correlations? For some time now I've been curious to know if there is any correlation between beer preference and coffee preference. I prefer both boldly flavored - IPAs and sours are my favorite beer styles and my coffee, a dark roast with no added cream or sugar, please. Looking at the full version of this infographic* finally prompted me to whip up a quick post and short survey to see what your preferences are. So if you wouldn't mind, take a couple minutes to fill out my six-question survey. Then check back next week to see what others had to say about their preferences. Or don't. *The infographic is less about beer and coffee than how their ingredients, alcohol and caffeine, effect the brain. That being said, it's one of the better infographics I've seen. A couple weeks ago I ran across this recipe for a beer cocktail that intrigued me. 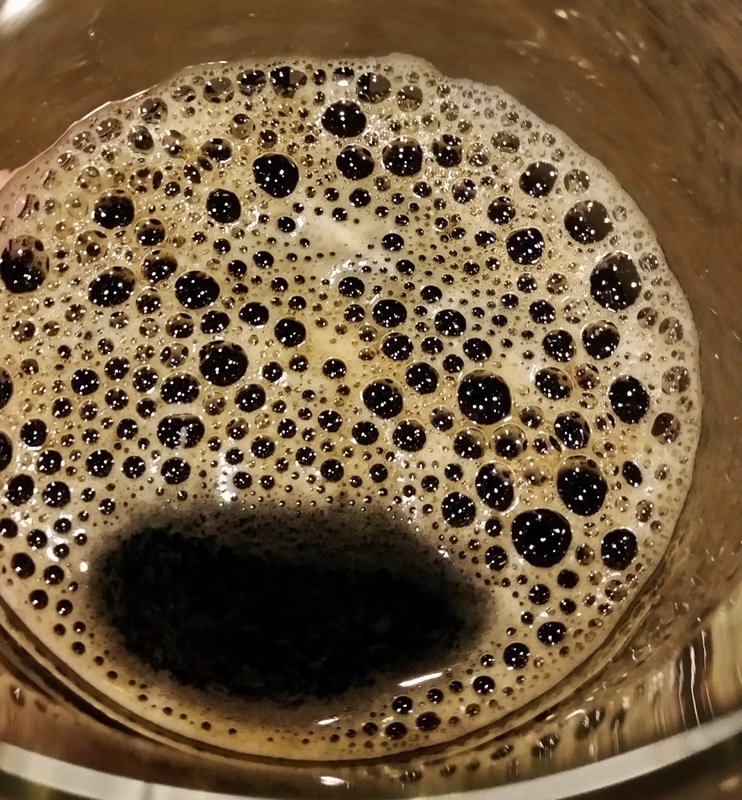 Having recently switched over from drip coffee to a French press every day we have the requisite "coffee grounds left in the bottom of a French press." Next I confirmed that there was still a bottle of Jameson in our very small booze collection. At that point the only thing that was missing was a can of stout. 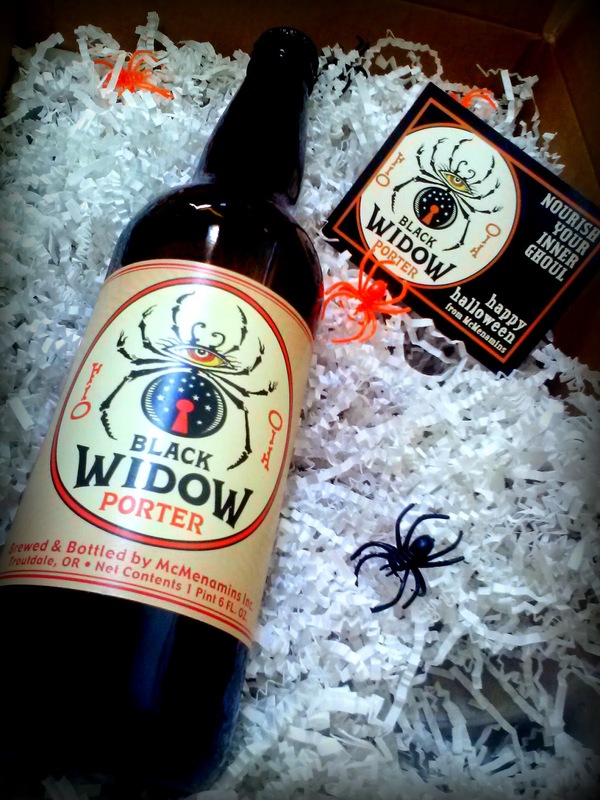 I meant to pick one up but hadn't gotten around to it by the time a little birdie told me that beer mail in the form of McMenamins Black Widow Porter would soon be gracing my doorstep. 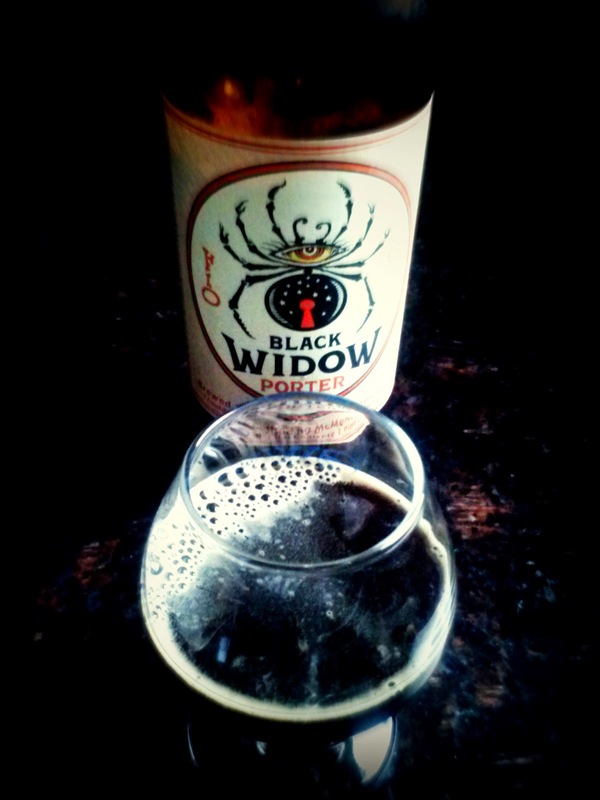 Sure, it would be a porter but since I often make substitutions when cooking I decided to use The Widow. Once the box arrived and the beer was properly chilled I cracked open the bomber for an unadulterated taste. It poured opaque black with a creamy head and roasty chocolate aroma. The flavor mimicked the aroma and pleasantly lingered. Although I was tempted to enjoy the rest of the bottle I stuck to my guns and started the beer cocktail experiment. 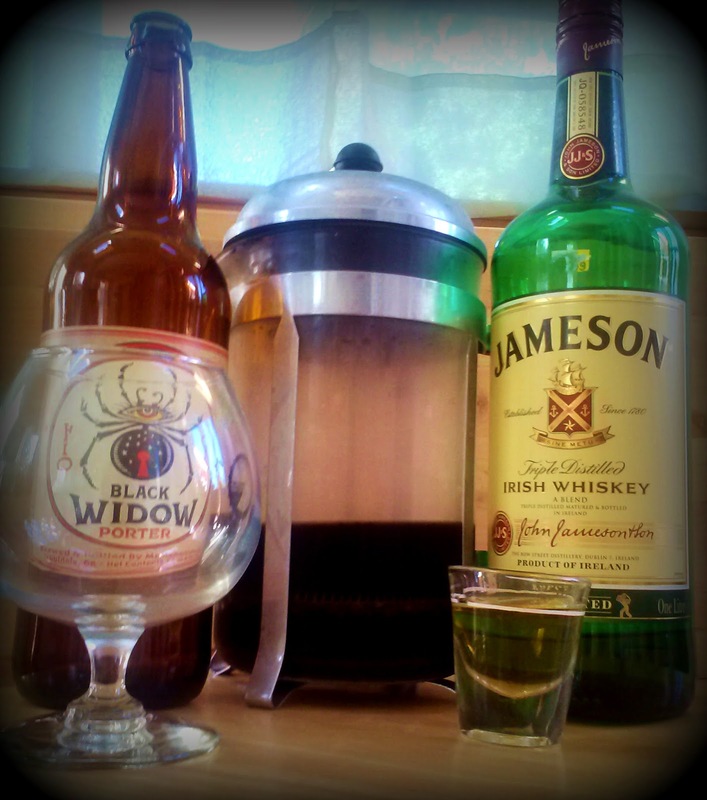 After allowing the beer to "steep" in the leftover grounds I reserved a bit of the mixture before adding the Jameson so that I could do a side-by-side progression tasting. You probably won't be surprised to hear that the beer and coffee grounds only mixture was a tad bitter and while I enjoy the beer solo best, the addition of the Jameson to the mixture served to smooth things back out. I didn't have a cigar handy as the recipe suggested but I can see how it would have been a nice accompaniment. The verdict? I'll stick to straight up beer for the most part but I'll definitely keep this in mind the next time I decide to have a cigar and intend to sit around for a spell sipping and smoking. If you happen to be similarly intrigued I'd love to hear what beer you used and what you thought about the resulting cocktail. Thank you to McMenamins for (unintentionally) fueling my experimenting. Please don't hold it against me; I believe in having fun with beer. Historically the only pumpkin beer I have actually enjoyed each year is Southern Tier Pumking. This year I haven't had any of it [yet] but I have found two others that shocked me by how good they were. They also served to remind me that just because I generally don't like a style of beer doesn't mean there won't be some brewer(s) out there that will use their creativity and talents to craft something delicious. The first that captured my attention was Punkuccino from Elysian Brewing. While they utilized usual suspects cinnamon and nutmeg, it was the twist of also using coffee that really made this beer stand out for me. Specifically they added a Stumptown coffee toddy with pumpkin to the mash, kettle and fermenter. 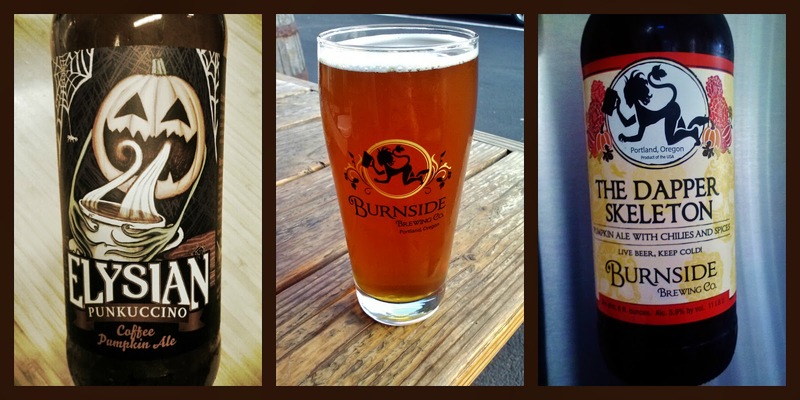 The second made me take notice was The Dapper Skeleton from Burnside Brewing. Here the goodness is the result of a great balance of Cherry wood smoked malt, chilies and cocoa nibs. As with their Sweet Heat, the amount and type of chilies used are just right so that they are present in the beer but compliment instead of overwhelm the other ingredients. In addition to what's contained in the bottles, both breweries did a great job with the label artwork. I'm hopeful that next year even more brewers will work outside of the standard pumpkin and spice box to create beers that rival these for my attention. 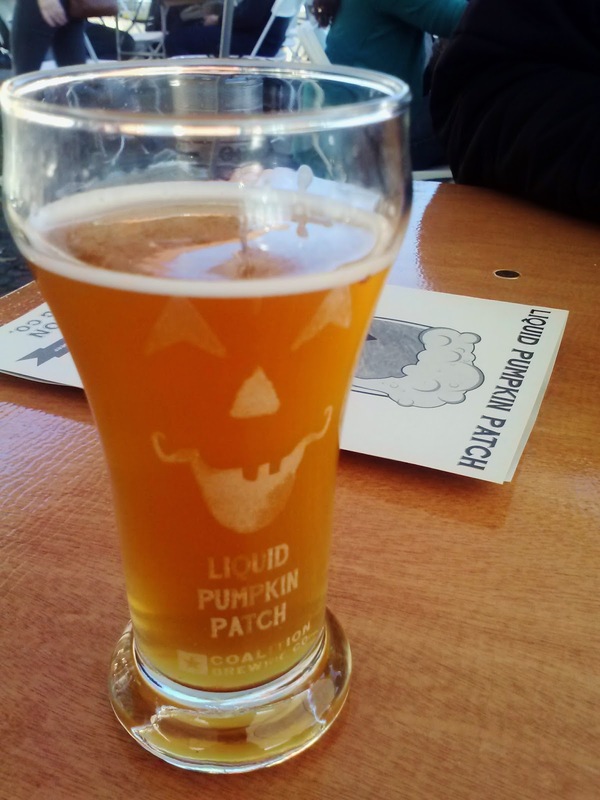 Have you had any particularly outstanding pumpkin beers? Yesterday was the second year for the Willamette Week's Pro/AM event, held this year at Zarr Studios in SE. I wasn't able to attend last year's event but heard it was great and I was stoked to be attending this year. Even better, I'd been invited to be one of five judges AND I knew a fair number of the pros and amateurs that were competing. With 21 pairs, and therefore 21 beers to drink my way through, I aimed to be strategic in my drinking, starting with the lower alcohol, lighter styles. Thankfully, there was a gigantic DigitalPour display projected on one of the walls for easy reference. It took a lot of restraint not to dive into the higher alcohol, darker styles I generally gravitate towards. And it took more focus to take thorough notes on each beer before moving on. As the afternoon wore on I also had to remind myself to keep moving to ensure that I made it through them all by 5:00 when then the judges would begin deliberating. The beers ran the gamut from a very flavorful India Session Ale brewed at Ecliptic by home brewing couple Jenn McPoland and Jeremie Landers to a pale ale made with Hogan's cedar tips and Brett from home brewer Dave Barnes with new kid, Baerlic, to a Baltic Porter that bordered on being a milk stout, made at Fort George by home brewer Chad Graham. While there were styles and beers I preferred over others there wasn't a bad beer to be had in the room and the scores I gave the beers fell into a relatively narrow range. In the end, after much deliberation, the judges chose their top three and by placing a marble in the pint glass of their favorite beer, so, too did The People. 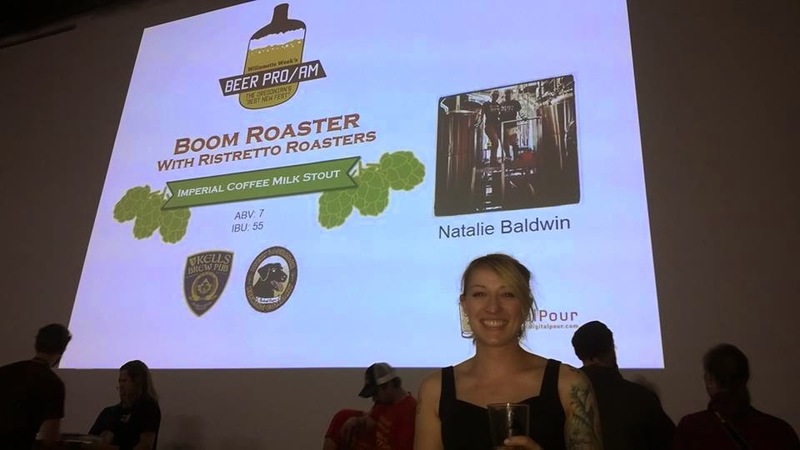 Besides Natalie having bragging rights for taking for taking both categories she also has the opportunity to have her beer re-brewed and put on tap at TILT. Thank you to Steph and all of the Willamette Week staff that pulled off a great event. Thank you to the home and professional brewers that worked together to make so many great beers. Thank you to my fellow judges for easing the daunting task of selecting a top three. If you weren't able to make it to the event, or are just hoping to have more of your favorites, keep your eyes peeled as I have a feeling some of these beers may be available (in very limited quantities) around town. First National Taphouse, now a two-location chain that started in Eugene, recently opened its doors near Portland State University in downtown. With a menu that is chock full of delicious-sounding dishes, 30 beers on tap plus a beer cooler that rivals many bottle shops in terms of size and quality, @FNTHPDX is starting off on the right foot. 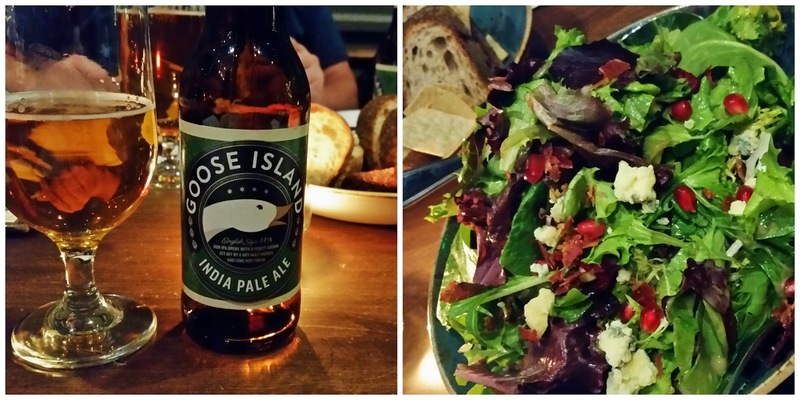 Last night I had the opportunity to check them out in the form of a five course beer pairing dinner. While I was hoping to try the Irish Rarebit I'd seen on a pre-visit menu perusal, the plates that were placed in front of me more than made up for not trying it (for now). Appropriately sized for an appetizer, a fist-sized potato roll was hollowed out and filled with a generous portion of praws, burnoise vegetables and brandy nosh. 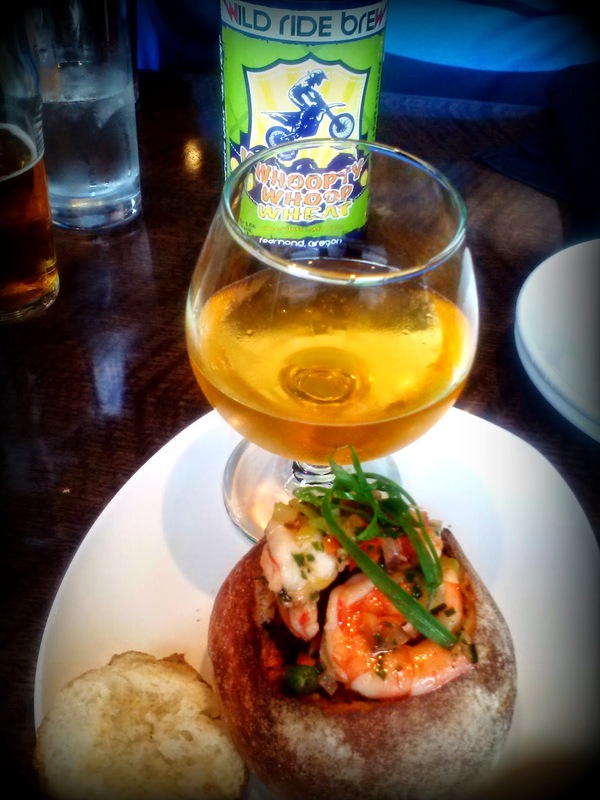 The beer, one I probably wouldn't order on its own, was almost too much for the delicate prawns but the spirit of the pairing was obvious and I enjoyed tasting the new-to-me Wild Ride Brewing. When first looked at the menu this was the course I was most looking forward to, both because CHEESE! and because I've been very pleased with the French ciders I've had up to this point. The pairing overall was outstanding (including the Asian pear slices) with my only complaint that I would have liked more of the Barbander Goat Gouda and Ancient Heritage Hannah. The house-made ricotta was a creamy compliment to the other two cheeses and the presentation unique. This was my least favorite course, both the food and the beer, but not because they weren't well-crafted, just that the flavors are not those that I enjoy. 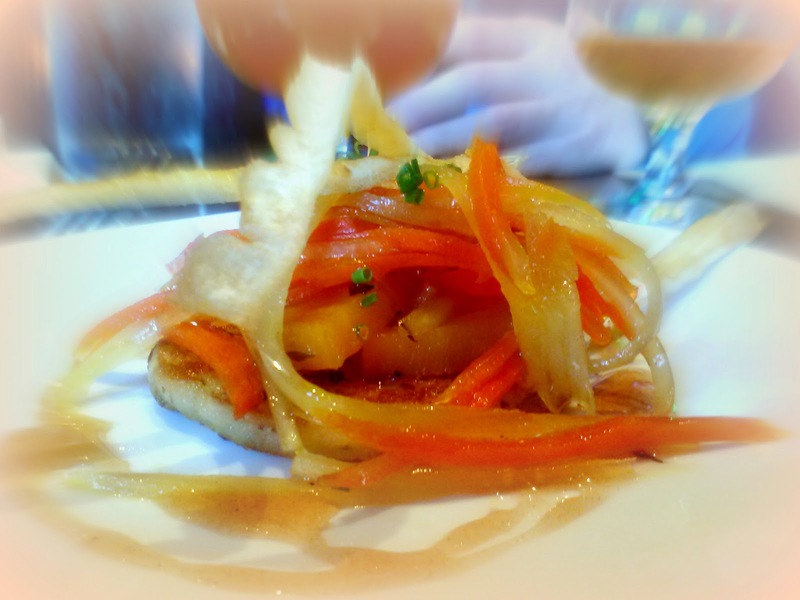 The boxty was an Irish potato pancake topped with sliced parsnip, spiced honey and julienned carrot and yellow beet. Without the parsnip I would have loved it but that's just me. As for the beer, after having recently been blown away by Elysian Punkuccino, The Great Pumpkin was just too assertively spiced for my palate. As far as I'm concerned you can never go wrong with an appropriately seasoned and cooked-to-order steak (rare for me). The pepper crusted hanger steak slices were delicious and while I would have eaten an entrée-sized portion happily, the portion was perfect for a multi-course dinner. As with the first course the beer almost overpowered the food but Deviant Dales on nitro is a rare thing I fully enjoyed. The final course followed the others in size, just enough to satisfy my sweet tooth. This was my first encounter with foam and I found the texture to be just slightly more dense than actual beer foam - ingenious! Even better, the salty brittle was amazing with the beer. Plus, edible (I assumed) glitter. 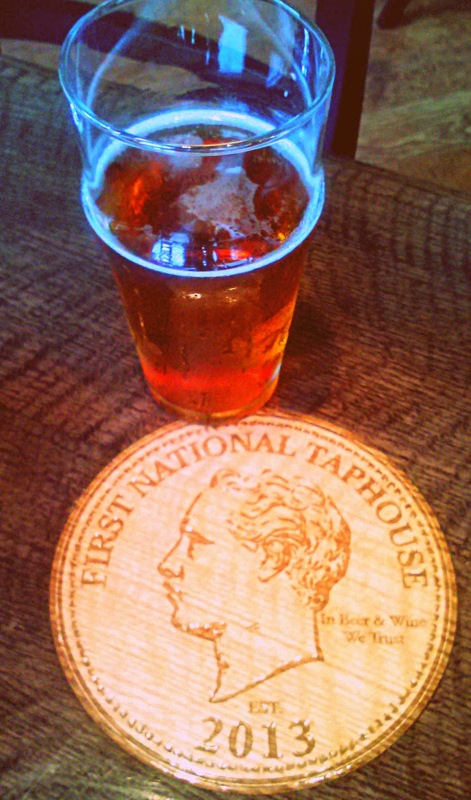 Thanks to First National Taphouse for the invitation as their location is not one on my regular flight path and especially to our wonderful server, Joe. I look forward to coming back for a happy hour (aka Bankers Hour), dinner or perhaps even brunch sometime soon. Somehow we've made it nearly to the end of September which means the holidays aren't far behind. Whether you're thinking it might be wise to rein in the beer spending a bit or thinking ahead to showing visitors that we not only have amazing beer here but you can get it for amazing prices, here's a round up of deals on pints and growlers. I'm sure there are a few similar deals on pints and growler fills around town that have gone undetected by my radar. If you know of any ($3 & under pints/$10 & under growler fills), leave a comment and I'll add them to the post. Your fellow drinkers thank you. 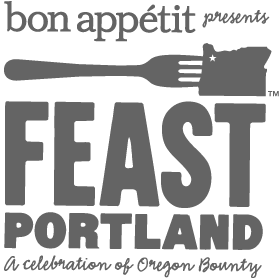 This past weekend was a fitting one to say an official good-bye to summer (today is the Autumnal Equinox) and the perfect weather for all of the Feast Portland events that took place. 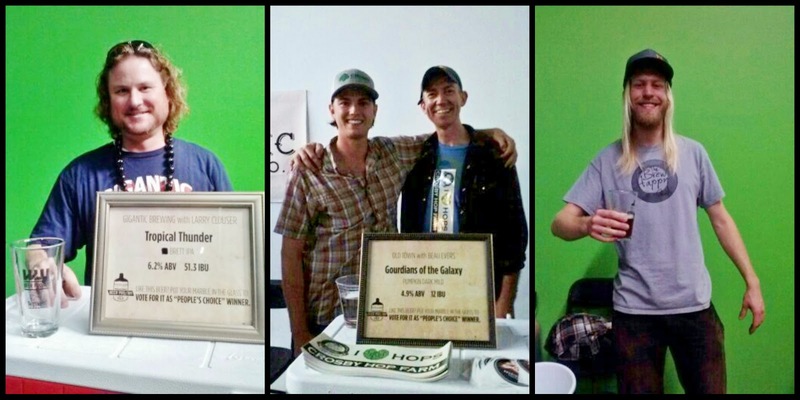 I was fortunate enough to have been asked to attend and "report back" by my friends over at #pdxbeergeeks. If you're so inclined, pop on over there to read about my visits to the Grand Bounty and Brunch Village. Warning: not responsible for any resulting drool puddles or seemingly inexplicable cravings. Recently I had the opportunity to be on the radio for the first time as a guest on Ginger Johnson's weekly show, Beer Radio, on KSKQ 89.5 FM. Not only would we be talking about all things beer but its timeslot lands conveniently during happy hour so it only seemed appropriate that I have a glass of hop goodness to whet my whistle during the show. Shortly before "go time" I opened the fridge and pulled out a recent beer mail gift - Noble Scot from Portland Brewing. This fall season is not a style that I usually drink as many Scottish Ales I've had in the past have been too malty or sweet for my palate. However as I have mentioned before, beers are continually surprising me so dove in with an open mind and palate. What I found was a slightly sweet aroma and beautiful, rich amber color once poured. Contrary to my memory of Scottish Ales past, there was a pleasant nutty flavor that I found quite enjoyable from the first sip to the bottom of the bottle. At 6.5% it is an easy drinking beer and suitable for times, like live radio, when one needs to keep their wits about them. Perhaps you'll grab a bottle and que up the archived version of Beer Radio to listen to me ramble on about my favorite beverage. Collaboration beers are fairly common place these days and with the trend continuing, it's evolving in new and interesting iterations. 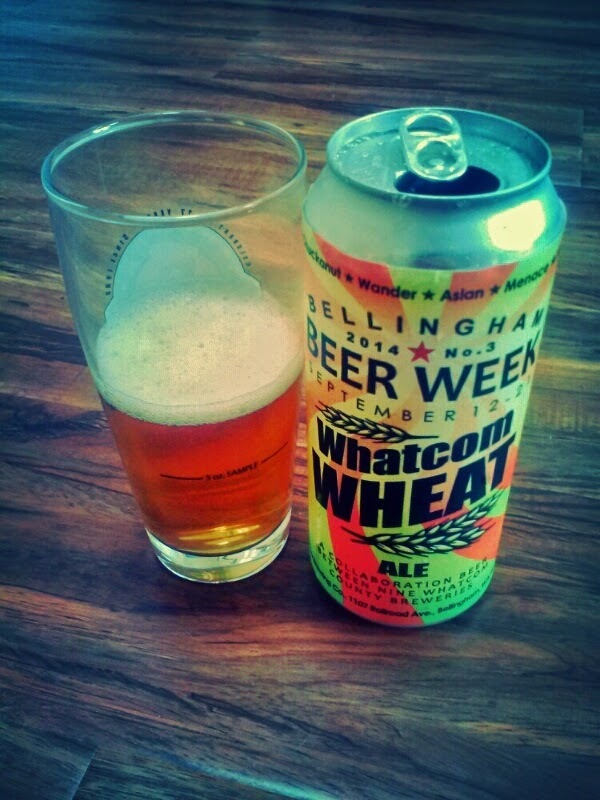 A friend recently gave me Whatcom Wheat, a collaboration of all nine Whatcom County (WA) breweries for Bellingham Beer Week, which starts today. In addition to some groovy, eye catching artwork on the 16 oz can, the beer itself was pretty good. Wheat beers are tricky waters for me to forge as if find strong banana and clove flavors displeasing. When I cracked this can open there was a distinct banana aroma that triggered my internal caution lights but it was for naught. Contained in the can was a well-balanced wheat beer that if it was available in my home market I'd happily buy more of. Over the summer, as I'm sure you've heard about was the nationwide tour/campaign/distribution from Sierra Nevada - Beer Camp. Not only did they collaborate with 12 breweries across the country for their 12-pk but they went to the next level by making a national tour out of it. Even with Eugene-based Ninkasi being one of the breweries involved, Oregon missed out on being a tour stop. While I was sad about that, I was fortunate to attend a Beer Camp event at The BeerMongers where they had all 12 beers on tap. I previously blogged about my favorites, one of which came from Asheville Brewers Alliance, the only one of the bunch that was a new brewery to me. Nonetheless, Beer Camp allowed me to have beers from some breweries that aren't generally available in this market. For that alone I applaud the effort. Recently a third collaboration caught my eye. 20+ brewers in North Carolina brewed a gose containing only ingredients from the state. I'm a big fan of that style but based on this Charlotte Business Journal article, it'll be unlikely I'll have a chance to see what this many "cooks in the kitchen" whipped up. Only eight barrels were made and beyond the World Beer Festival in Durham, NC and the breweries' own tap rooms, the only other place it will be making an appearance at is the Great American Beer Festival in Denver. The GABF pouring is one that the breweries hope will enhance North Carolina's up and coming craft beer scene. Kudos to them. How about you, have you been noticing more and more collaboration beers? What do you think of the idea or the beers themselves if you've had a chance to try them? As you read this, fermenters across the McMenamins empire are filled with batches of 2014 Thundercone Fresh Hop Ale. In what is certainly no small feat, 1120 pounds of Brewers Gold hops from Sodbuster Farms were delivered to all 22 McMenamins brewing locations yesterday. 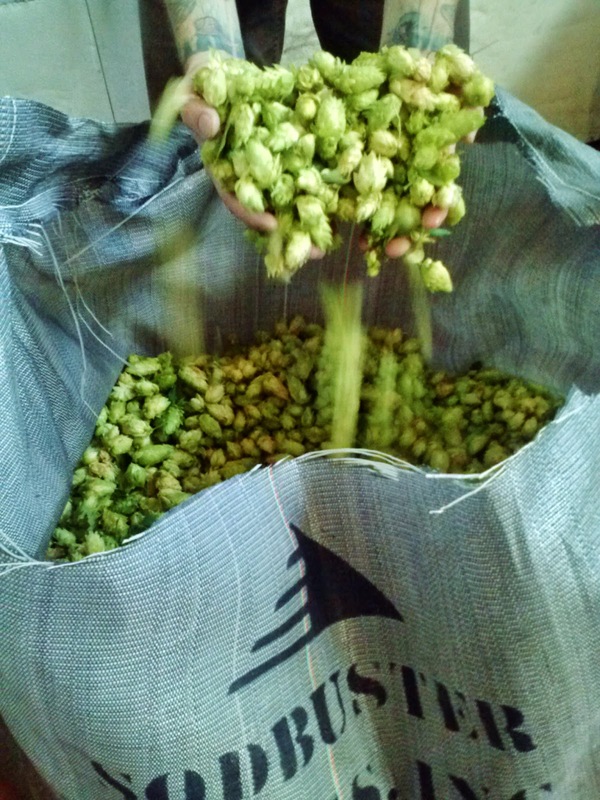 It took a fleet of eight drivers just under five hours to drop off the fresh hops. From there the brewers went to work. I had a chance to visit the Concordia Brewery, housed at the Kennedy School, as brewers Dave Kosanke and Matt Carter spent a full day brewing a double batch. Walking into the brewery I was hit with the familiar, but always just as pleasing, aroma of my favorite beverage being made. Coming in pre-sparge of the second batch, it wasn't until Dave opened the bag of fresh hops that I was treated to the bright scent of fresh hops. During the brewing I had a chance to get a little history on Dave that included finding out he's an IA/MN transplant like me, although he's been calling Oregon home for much longer. He's been with McMenamins since 2001 where he started out as a bartender...a bartender that was also a home brewer. 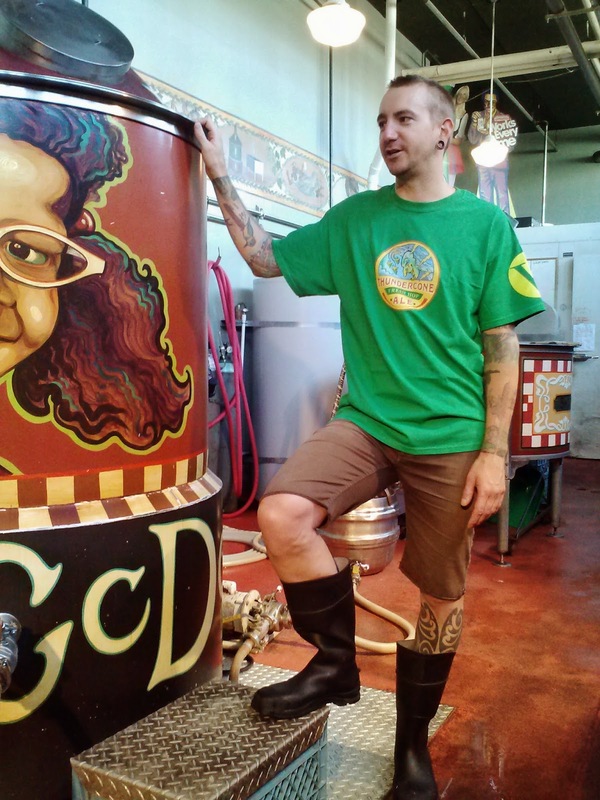 Attending a formal brewing program was something that Dave had looked into but before he got around to making it happen a brewing internship opened up at Edgefield. In the two and a half years since then he's been working in the "cozy" facility at Concordia that turns out 300 kegs per month. 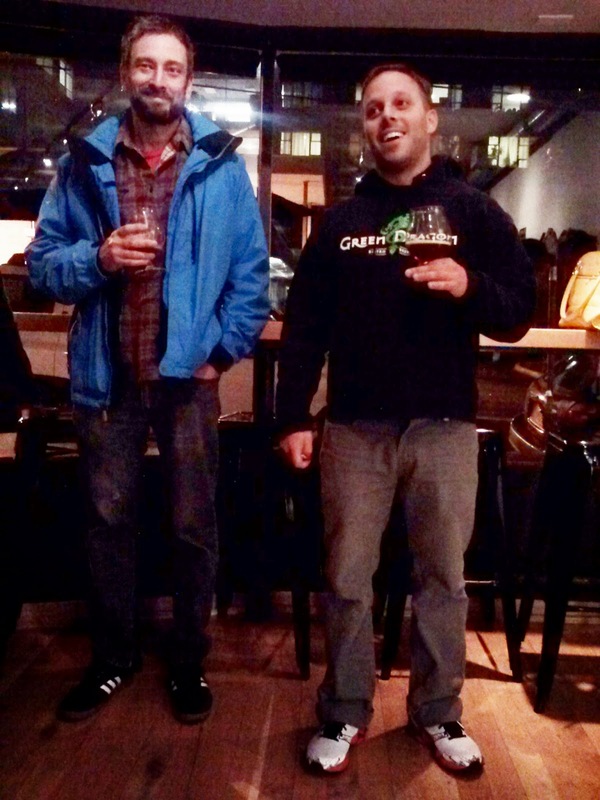 Both Dave and Matt are big fans of lagers, with last year's Doppelbock being one of the favorites created. They would jump at the chance to brew lagers more often, but time and space constraints make turning out ales the majority of their production. Thundercone will be hitting the tap lines Friday, September 19th. As with all fresh hop beers, it probably won't last long. Gresham is an easy place to poke fun at -my friend who lives there even makes fun of it - but like most places there are not nice parts of town and other parts that are just fine. Downtown Gresham falls into the latter category and is actually quite quaint. My friend who lives there frequents The Hoppy Brewer, a home brew shop/brewery/bar, which is similar to Sellwood's PDX U-Brew. With nothing planned Labor Day Monday we decided it was high time to make the "trek" to Gresham to check it out. Nestled among a multitude of storefronts on N Main Street in downtown Gresham, we did a quick walk through of the indoor space before quickly settling down at a table on their patio. Nearly before we finished checking out the tap list, the friendly beertender came over to take our order. With only one house-brewed beer on tap at the time, I jumped right on it before giving the name, Fiesta Ceraveza, too much thought. There was no style listed and with an ABV of 5% I was somewhat fearful of a lager or pilsner but was determined that regardless of style I wanted to give Krauski's Brewskies, the name of the brewing entity, a try. As it turned out I was in love with the beer from the first sip! I'm a sucker for sour beers and this one was refreshing, perfect for the first of the day. 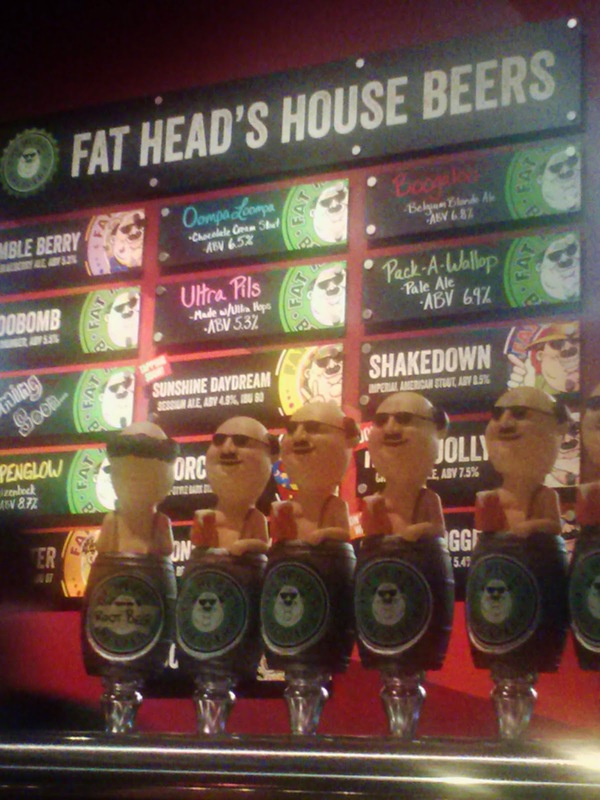 I was a bit confused by its listing as a chili beer on Untappd until I had a chance to talk to owner and brewer Steve. 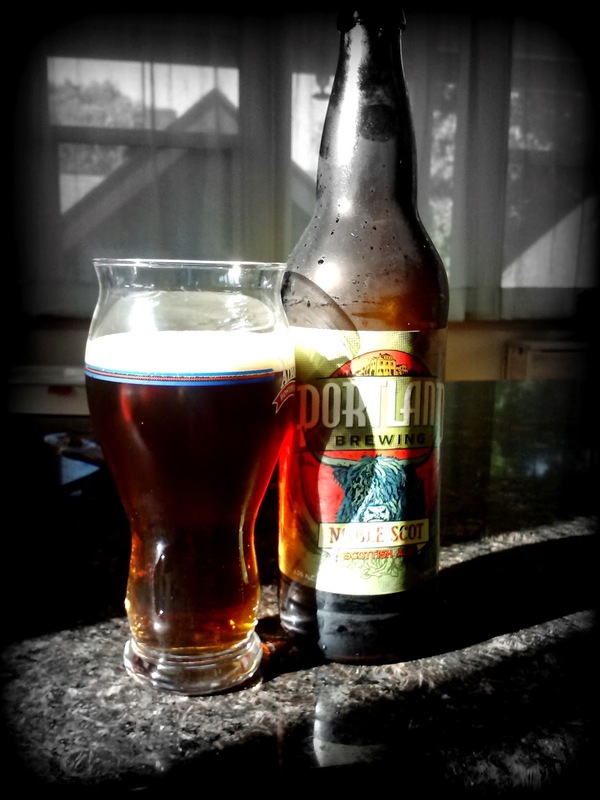 Brewed in June, he used mild poblano chilies, which he said were much more pronounced initially. This was the last keg of it and he agreed that the chili flavor had faded, leaving the sourness to dominate. Once the chili seed had been planted in my head I could faintly pick it up. In addition to the beer, we knew we had to check out the restaurant that shared the patio with The Hoppy Brewer - The Local Cow. Strange name but delicious food! Mag went with our friend's go-to order of caprese sliders with the addition of meat patties and I couldn't resist the pimento cheese-bacon-roasted jalapeno-goat slayer sauce pull of the El Chupacabra. 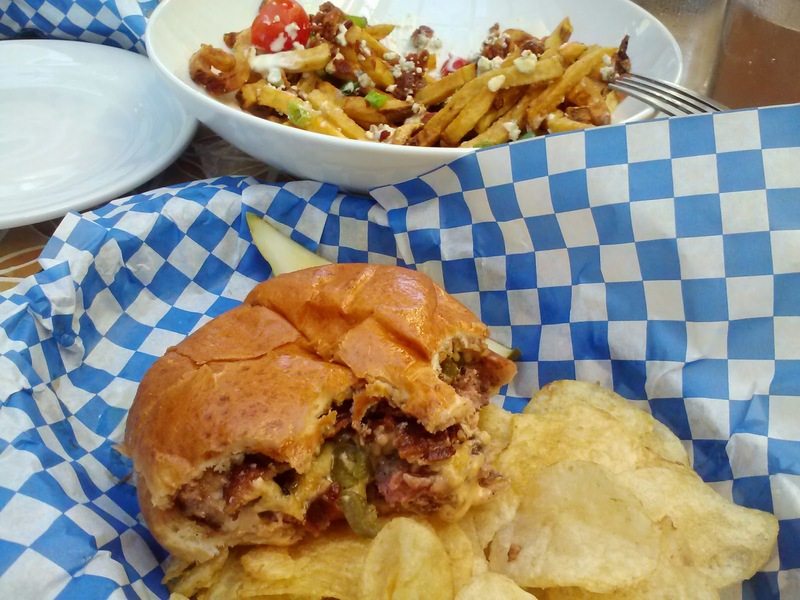 While he enjoyed the sliders, Mag agreed my burger was outstanding and one of the best, if not the best, burger we've found in the Portland area. And their bleu fries certainly rival Breakside's. 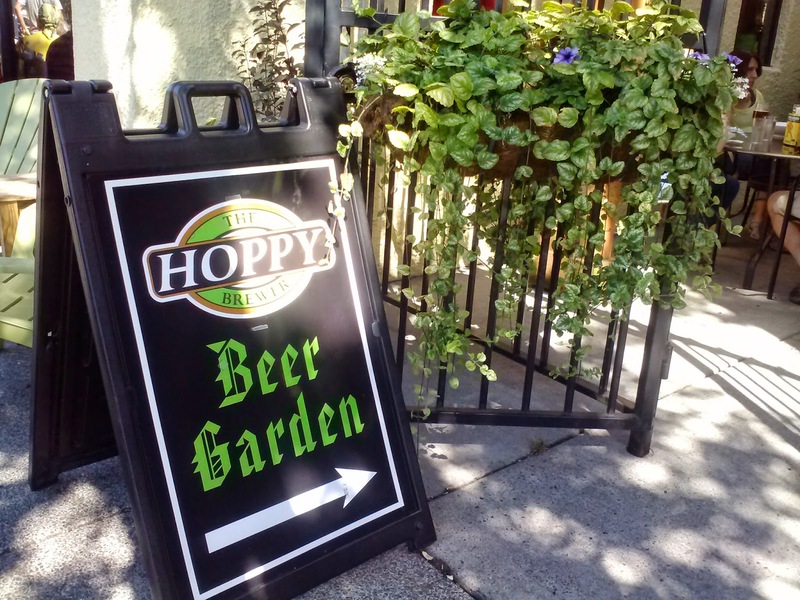 So the next time you're looking to try something a little out of your regular flight path, I encourage you to check out The Hoppy Brewer. 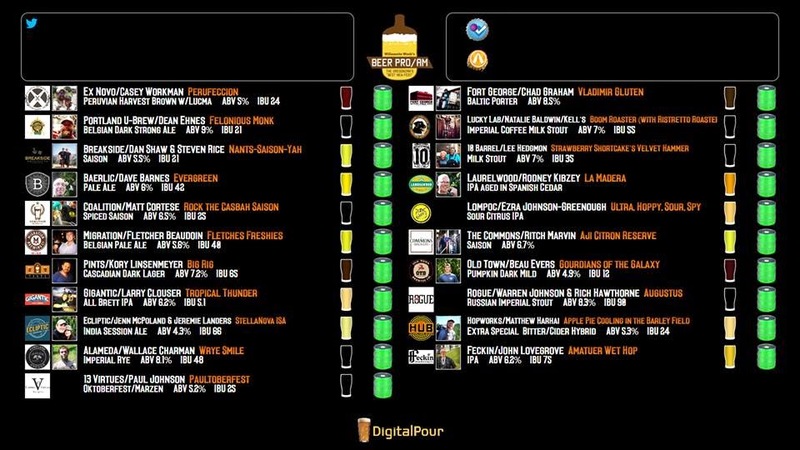 They'll soon have their 25+ tap set up complete, presumably with more house beers available. Add on a meal from The Local Cow and I dare you to say it isn't worth the trip. Even as we wind down from the height of summer, weekends are still packed with beer events too numerous to attend them all, meaning you'll have to make decisions about which ones to green light and which ones will have to be missed. In this crowded arena it's easy to focus on the most well publicized ones and I stand by my conviction that if you want me to visit you have to remind me to do so. With that said, I offer up a couple of options for the upcoming weekend that may have flown under your radar so far. Kells flies a little under the craft beer radar in general but that doesn't mean the guiding hand of Dave Flemming isn't turning out good product. The newest location of Kells in NW is the place where that magic happens and as it turns out, they're celebrating their 2nd anniversary this Friday. Two special tappings will take place at 6:00 pm, followed by live music starting at 9:00 pm. Billy Ray Citrus CDSL: This beer was specifically brewed for OBF and one keg was held back for the anniversary. Billy Ray Citrus merges the dark roasty richness of a stout with the smooth, easy taste of a session lager. Two-row, caramel, carafa II (dehusked black malt) and Vienna malts are balanced by Northern Brewer, Hallertauer, Mt. Hood and Saaz hops, a great blend of the traditional European noble hops with the freshness of the Northwest. Fermented with lager yeast at room temperature gives this beer its fruity esters and a mild green-apple aroma. The first Mighty Mites Festival I attended was back in 2011, held behind Coalition Brewing, in the space that is now home to several food carts. 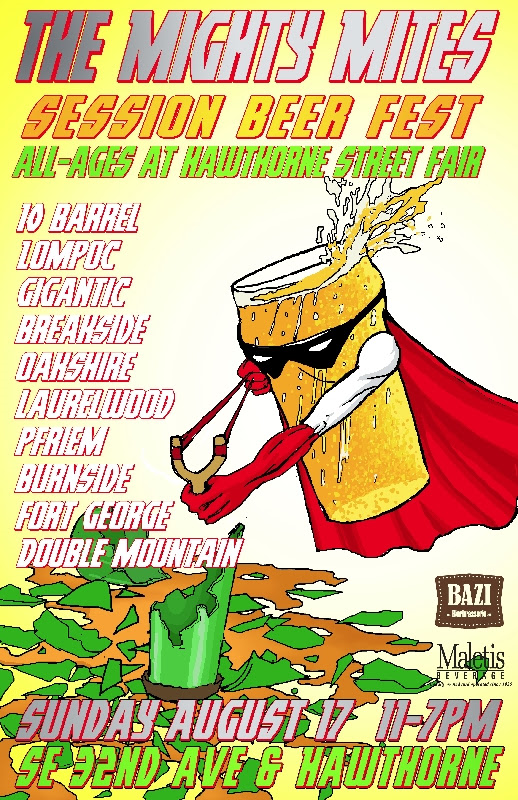 It took a hiatus in 2012, returning last year as part of the Hawthorne Street Fair and will be a part of the Fair again this year, situated outside Bazi Bierbrassiere. For $10 you'll get a sampling glass plus 4 tickets, each good for a 7 oz sample. The 10 beers range from tart to hoppy, all with an ABV of 5% or less, meaning you could probably have all 10 even if the rooster crows early for you on Monday morning. Whatever your weekend plans are, have a good one and enjoy many a good craft beer! When was the last time you visited The Mash Tun on NE Alberta? Months ago, years ago, maybe never? Then it's high time you stopped in. I can't say it's a place I visit more than a few times a year, mostly because I just don't get up NE Alberta much and when I do there are so many places competing for my attention (many of which I was reminded of as I was making my way there last night). To help me remember to go more often and to prompt you to do the same, here are three reasons you should pay them a visit. 1. Their Alberta St Pale Ale is a deliciously bitter, full flavored beer. While pale ale purists may say it leans too far in the IPA direction I find it lovely and highly drinkable. 2. They have a great patio. Not only does it double their seating but it backs up garden boutique Thicket and is adjacent to Pine State's patio. You'll have no idea you're sitting just steps from bustling Alberta. 3. Tuesdays are $2 pint days. Yes, you read that right, $2 for any house pint all day. Add in their daily happy hour food offerings (3 - 6 pm) and you've got one of the least expensive ways around here to spend a Tuesday evening. On previous visits the food has been hit or miss but I'm pretty sure I've always gobbled up their tots and I have a friend who can never pass up their beet salad. As for the rest of their beers, again, hit and miss. Their IPAs, generally only one is available at a time but they change periodically (last night it was a single-hop version using Galena hops), are generally serviceable but not outstanding. Mag found his Blackberry Oatmeal Ale to taste a bit homebrew-y while the sip of Regan's Feats of Strength I had was outstanding. Will this be a place you take out-of-towners to? Probably not. 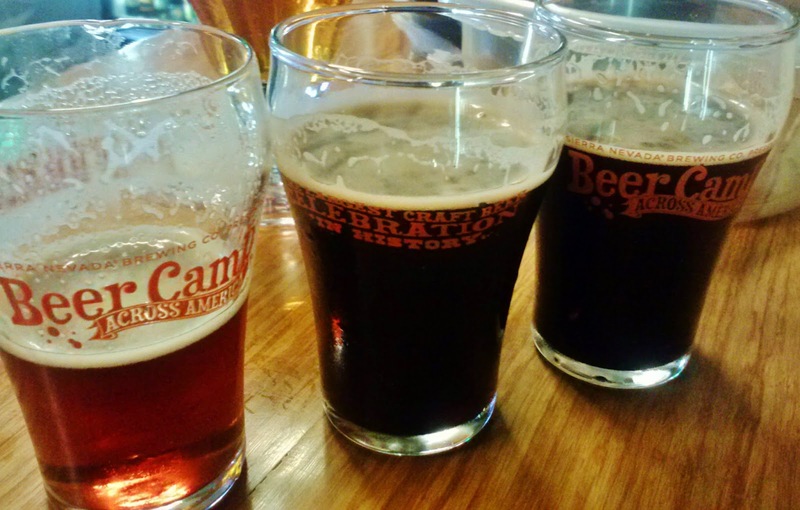 Will it be the first place that comes to mind when you're looking for a brewpub? Probably not. Will it be a place you visit occasionally? I sure hope so, especially on Tuesdays.